Unmanned SpaceX rocket Falcon-9 has exploded minutes after lifting off from Cape Canaveral in Florida. Rocket debris tumbled out of the sky into the Atlantic Ocean. Falcon-9, which had 18 straight successes prior to Sunday’s flight, was in the process of sending a cargo ship to the International Space Station (ISS). NASA says important supplies have been lost but the orbiting lab’s crew is secure. Even now, the three astronauts have sufficient stores of food, water and equipment to operate until late October, and there should be visits from Russian and Japanese freighters before then. The problem occurred 139 seconds into the flight, just before the first-stage of the rocket was about to separate from the upper-stage, or top segment of the Falcon-9. “The vehicle has broken up,” said NASA commentator George Diller, as TV images showed the white rocket falling to pieces. “We appear to have had a launch vehicle failure,” he added. 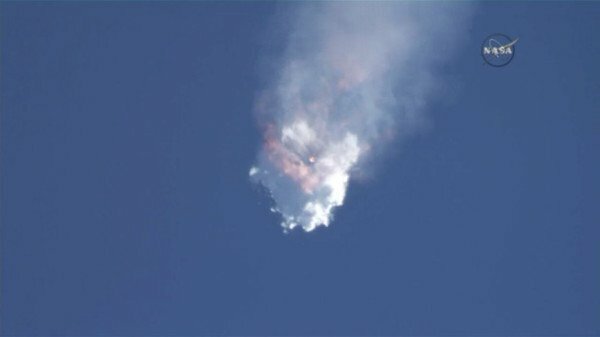 “There was an overpressure event in the upper-stage liquid oxygen tank,” tweeted SpaceX CEO Elon Musk. SpaceX will now lead an investigation, overseen by the Federal Aviation Administration (FAA) and NASA, which contracts the California company commercially to resupply the station. This means there will be no further Falcon-9 launches in the immediate future. NASA had loaded SpaceX’s Dragon freighter on the top of the Falcon with just over two tonnes of supplies. These included a new docking mechanism that will be needed when future astronaut vehicles – one of them based on the robotic Dragon itself – come into service later this decade. The agency has a second mechanism that it will be sending up shortly, but it will now also have to build a third to replace the one lost in the Atlantic. NASA’s associate administrator for human spaceflight, Bill Gerstenmaier, said:“I think this points out the challenges and difficulties we face in spaceflight.